This Sunday, May 1, join Birthright Israel NEXT and JUF's Young Leadership Division with support from the Holocaust Remembrance Committee and the United States Holocaust Memorial Museum for a very special Yom Hashoah screening of award winning documentary “A Film Unfinished.” Estelle Laughlin, a volunteer with the United States Holocaust Memorial Museum, will share her account of living in the Warsaw Ghetto, followed by a screening of the film in which Israeli filmmaker Yael Hersonski exposes a long missing film reel from the Warsaw Ghetto— unmasking new dimensions of the Nazi propaganda effort. Estelle was just 10 years old, living in Warsaw, when the war broke out. Estelle, whose father was one of the organizers of the Warsaw ghetto uprising, reflected on the bravery and tenacity of the resistance fighters. 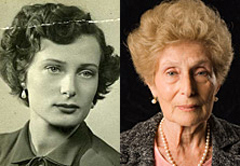 In the Warsaw Ghetto, Estelle and her family hid to escape the deportations. Estelle’s family was taken to Majdanek, an extermination camp, where she, her sister and her mother survived—her father was sent to the gas chamber. The three women were later sent to two different labor camps and were liberated from the Czetochowa camp in January of 1945. To escape pogroms in Poland following the war, they moved to Bavaria in August of 1945 and eventually moved to the United States. She now lives in Chicago. Today, Estelle volunteers at the U.S. Holocaust Memorial Museum. She speaks about her experiences during the Holocaust not to reflect on “the curse of darkness of the past” but rather “to illuminate the future.” She discusses her story further in her memoir— set to be released next year by Texas Tech University Press. At Sunday’s event, Estelle wants to emphasize that which gave her the strength to survive. The evening begins at 5:30 pm in the Gene Siskel Film Center café and gallery, 164 North State St, where appetizers will be served. The program will begin at 7 pm with Estelle Laughlin, a volunteer with the United States Holocaust Memorial Museum, sharing her account of living in the Warsaw Ghetto, followed by a screening of the film.